Bright colors characterize our booth displays. You’ll see here that I have placed our SM401 “Hummingbird to the Sunflower” design against a variety of backgrounds. 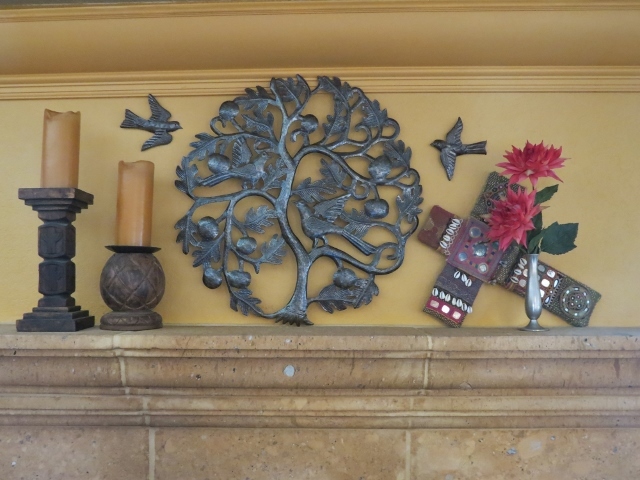 Just as our Haitian metal sculptures adapt well in a number of decorating schemes, they also are inherently versatile against a wide range of colors and textures. See what I mean? And you aren’t even limited to hanging it on a wall. You could stand it up in a window, as in the bottom right photo. Or lean it on a shelf. 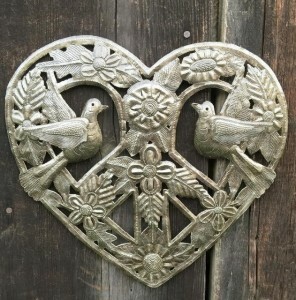 Or hang it on a fence…You are limited only by your creativity and imagination – and certainly not by color and texture. Display away! a “word person” I always think that sounds funny. In the literal sense it defies logic, yet I know that they are quite right. The image is static, but it feels otherwise. 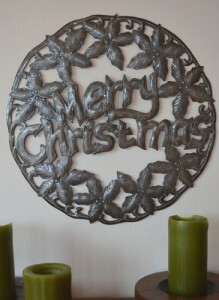 In fact, many of our Haitian metal art pieces are suggestive of movement. 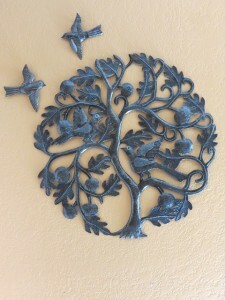 Take for example our various trees of life. In the example to the left here, the design elements of the birds’ outstretched wings, the gently bowed trunk of the tree and its curved branches all work together to form an illusion of growth, wind and flight. The implication of activity is clear. 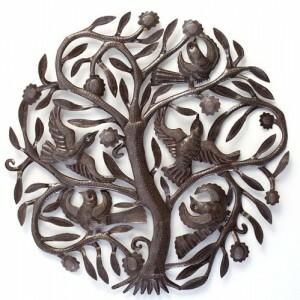 A couple of birds hung in place near the tree become a wall grouping, Together, they create a greater illusion of movement. branches provide safe haven until morning dawns. Okay, that may be a little flowery, but you get the idea. 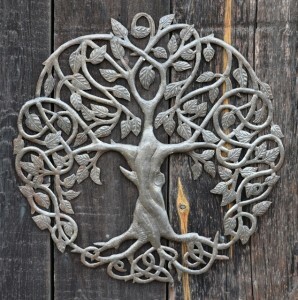 You’ve got your Tree of Life. Maybe you’ve had it for a while and you want to give it a new look, extend the movement, and tell a larger story. The solution is simple: Just add birds! Now you’ve got a story! 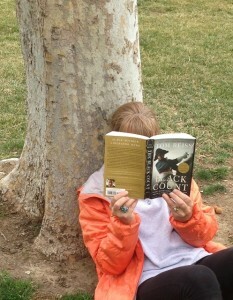 The shade of a beautiful tree is the perfect place to relax with book. Tree of Life by Wilson Etienne. A beautiful tree and here’s a suggestion for the book to read underneath: “Black Count” by Tom Reiss. A page-turning biography, Reiss says he likes to think of the central figure as history’s greatest underdog. His book introduces readers to General Alex Dumas, the man that inspired so many fictional heroes of 19th century French literature, among them Athos, Porthos, Aramis, and D’Artagnan, of “The Three Musketeers,” and most closely, Edmund Dantes of “The Count of Monte Cristo.” These characters of derring-do sprung from the creative mind of the real son of the real “Black Count,” novelist Alexandre Dumas. “Alex Dumas was a black man, sold into slavery in Haiti as a child, who eventually rose higher than any black man ever rose in a white society before our own time,” Reiss asserted in an NPR interview in 2012. “He became a four-star general 200 years ago, at the height of slavery.” This achievement almost defies comprehension, given that slaves in the French Caribbean colonies were appallingly mistreated and had an average survival expectancy of only 10 years. To read under your tree, may I suggest The Black Count. Art and literature, two of life’s great pleasures! The product of a union between the ne’er-do-well son of a white French marquis and a black slave woman, little Alex grew up on a small coffee plantation that his father had purchased in southern Haiti. He lived rather ordinarily, much as any boy of the colony would, playing in the jungles, fishing and exploring until about the age of 12 when his father abruptly sold him into slavery. Alex’ grandfather in France had just died, and his terminally cash-strapped father need money to pay for his own passage to France, where he could claim his title, inheritance, and lands. Interestingly, once Alex’ father’s inheritance was secured, he sent for the boy through a repurchase agreement with the owner. After 2 years of enslavement, Alex sailed for France, the passenger docket listing him simply as, “the slave, Alexandre.” The timing was perfect. With the rallying cry in France growing ever louder, “Liberte, Egalite, Fraternite!” young Alex was welcomed into French society and provided with the best educational opportunities. He also learned war-craft, becoming an excellent marksman, swordsman, and equestrian. As an adult, Alex embraced the ideals of the dawning Revolution and took up its cause. His rise coincided with that of another young general of considerable talent: Napoleon Bonaparte. General Bonaparte was more than aware of Dumas’ capable leadership, physical presence, and bravery in battle, and quickly came to regard him with adversarial jealousy. During the French army’s Egyptian campaign, Dumas and Napoleon’s rivalry intensified and the two clashed in a very public ideological disagreement. At that point, Napoleon’s jealousy evolved to a dangerous and vengeful hatred. On their way back to France, Dumas’ ship was diverted in a storm. He was kidnapped under mysterious circumstances and held for ransom, which Napoleon conveniently ignored. Dumas was eventually thrown into a fortress dungeon and forgotten. Does it get more swash-buckling than that? Want to know what happens next? I’ve got two words for you: Read it! 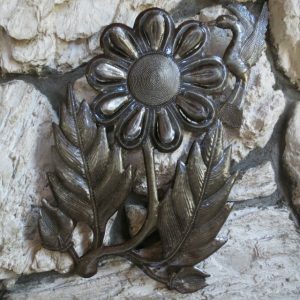 Chalking the design onto the metal is one step in the process of creating metal art. During our last trip to Haiti in October, we brought along our favorite filmmaker, Mary Ragsdale, to capture “our Haiti” on video and enable us to share the experience with you. After long hours of shooting and even longer hours of editing, she has come through for us in a big way. We are so pleased! Set to an a cappella Haitian folk tune, the film opens with a stroll down the main street of Croix-des-Bouquets. A counter-melody to the song is the unmistakable syncopation of hammers ringing out against steel. From the street, the viewer is lead into several of the artist’s workshops and introduced to the artists themselves by our business partner, Roody Soulouque. 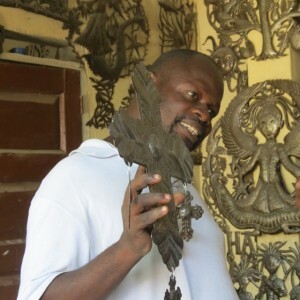 Inside the shops, sculptures hang in wondrous array and the artists demonstrate the skill of their craft. 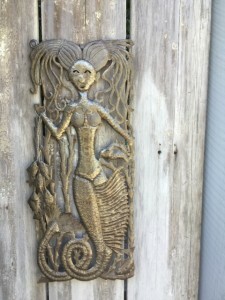 Watch and see how the designs are drawn with chalk pencils onto the metal, then cut with chisels, sanded smooth, and finished with a weather-coating. Maybe you’ve been around us long enough to know the story of the artistic process. You’ve seen our photos at shows and in pamphlets and information cards. Maybe you have it all perfectly focused in your mind’s eye. But there is a story within the story. Notice the smaller details captured by Mary’s lens: the warm greetings, the easy smiles, and above all, notice the pride. As one of the artists, Jean Claude Soulouque, says as he holds up his one of his best-selling sculptures, “I have seen this. I have seen it. 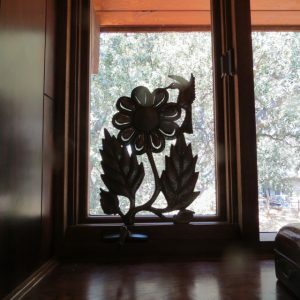 It is from my ancient fathers, and that is what I do.” It is the family business, handed down from one generation to the next for nearly 60 years. And did you see all of the collared shirts on the men? Mary captured those as well; clean, pressed, and hastily pulled on just as we arrive. Probably their best shirts, likely reserved for occasions of note. Best foot forward. That too, is pride. At risk of saying it one too many times, It’s Cactus is about giving opportunity. Enabling our artists to earn their way, to provide for their families, to be successful, and to take pride in what they do. Mary captured that pride. Look for it in the video and be proud too, that your purchases make a positive impact. It is a pride we can see and pride we can share. Jean Claude Soulouque holding his “Cross with Milagros inside his workshop in Croix-des-Bouquets. As most of you are well aware, It’s Cactus’ reason for being is to fight poverty with art. We pursue a market-based solution to uplifting lives and improving economic security for our artists, their families, and their communities. We’ve been dedicated to that purpose for over 20 years and we’ve been doing it at various times through physical storefronts, retail and wholesale shows, and building a strong online presence. This includes not only marketing on our own It’s Cactus website, but also on social media, such as Facebook and Pinterest, as well as on retail sales sites like ebay, etsy, and the retail mega-giant, Amazon. “Why Amazon?” you may ask. “Isn’t that kind of like bargaining with the Devil? Aren’t you in competition with yourself that way?” The answer to these questions lies in the numbers. According to Michael Hayes of “Shopify,” Amazon lands 85 million unique monthly visitors. Another source tells us that 44% of online shoppers go to Amazon first when looking for goods. In other words, while a new customer may find us on Amazon and make his/her first purchase through Amazon, we have the opportunity to win that customer through giving them a wonderful product, providing excellent service and fulfillment, and have the chance to introduce ourselves and our own company to them. It’s a chance we can’t afford to miss and more importantly, it’s a chance we don’t want our artists to miss. Giving them the greatest opportunity to sell their art is why we are in business. SO…strange as it may seem, I am encouraging you to shop Amazon now through Feb. 15th for It’s Cactus products. It’s a great time to do it! It will happen only twice per year; now and again in August. Amazon works with us to determine how much product to ship to their fulfillment centers and, for a set amount of time, those products are stored for distribution there for free. However knowing exactly how much will sell lies somewhere between math and magic. 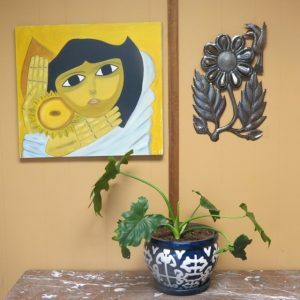 Rather than pay for having the goods returned to us after the specified time has passed, we’d rather have a sale and enjoy our customers reaping the benefit of 40% off our regularly priced pieces of terrific Haitian metal art. Below is a list of links to all of the products that we are selling at the reduced rate. Just enter promo code “Cactus4U” at checkout and score the discount! BUT, we would so appreciate it if you would take the time to give your new and wonderful sculpture a star rating when you have received it. Marketing research by “Big Commerce” shows that 92% of customers across the board rely on product reviews when making their purchase decisions. What these product reviews mean for our artists, is that their work is something to get excited about. That excitement translates directly to their increased sales and greater economic security. Ready to join us in fighting poverty with art? Shop the sale, rate your product with (lots of!) stars, and know that you are fighting the good fight! In a previous blog, I declared my deep and abiding love of chocolate. 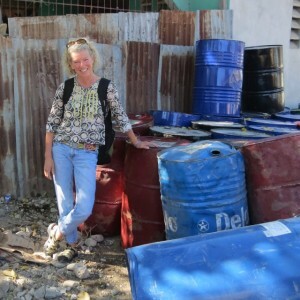 I have written too, about market-based solutions to the problem of poverty in Haiti. Can you imagine my delight at coming across a company that has both! 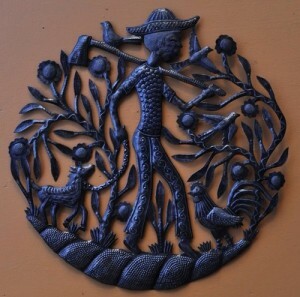 Haitian metal version of a farmer at work by Johnson Cajuste. 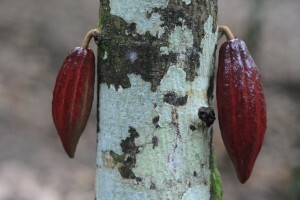 sweeter, less bitter flavor, they produce a 40% milk chocolate bar and a 60% dark chocolate bar and have plans to develop other flavors with 70% in the works. I am happy to report that the dark chocolate that I ordered from Askanya for my family was very enthusiastically received. I don’t pretend to describe flavors well, but I think I detected some fruity notes (Cherry, maybe?) and the overall taste and texture were delightful. It is exciting to meet people such as Corinne, with visions so similar to that of It’s Cactus for fighting poverty and uplifting lives. 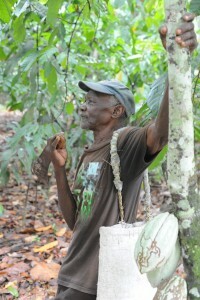 By providing opportunity and employment, by teaching skills – whether they be quality management, marketing, or chocolate-making – and by treating trading partners with respect and care, real growth and prosperity can be achieved. Hang up the art and pass the chocolate! Jude Celestin, the candidate with the second-most votes, has charged that the Oct. primary elections were fraudlent and declared that he would not participate in any run-off unless his conditions were met. All six pages of them. 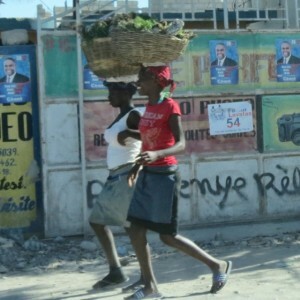 Among his complaints is that the membership of the CEP – Haiti’s version of our Electoral College – is selected in dubious fashion and thereby has no credibility in decision-making for either the primary or the run-off elections. A government-appointed investigative commission looked into Celestin’s fradulency claims and it too discredited the elections, citing a sky-high number of voting “irregularities” and presumption of fraud. The Commission echoed Celestin’s call for sweeping changes in the electoral machinery to include the CEP. Yet another group, called the G-8 and composed of several presidential candidates from primary race that didn’t qualify for the run-offs, publicly bashed the Commission’s findings. G-8 says that while the Commission verified voting irregularities, it did not identify the beneficiary of those irregularities. In other words, the losing candidates are questioning whether or not they actually lost. Good point. Are you confused yet? Wait, there’s more! 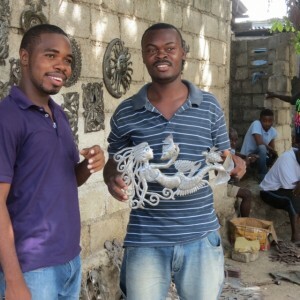 Heart sculpture symbolizing a wish for peace and love in Haiti. The December 27th run-off election date was postponed so that these investigations could be carried out. Two weeks ago, a January 24th run-off date was put forward by the (possibly slimy) members of the CEP. Outside observers are now pressuring the Haitian government to go through with the elections on that date with or without Celestin. The problem there is that Jovenel Moise, the government-backed candidate, might be the only one running. If no president is elected and installed, “in peaceful transfer of power,” by February 7th, it will become necessary for a provisional government to be formed in accordance with Haitian constitutional law. That’s what has the outside observers worried, of course. Could you read that to me in Kreyol? 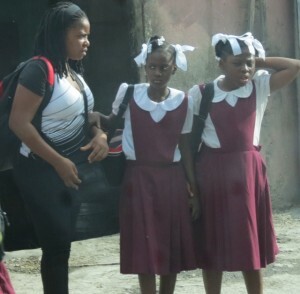 Uniformed schoolgirls ready to head home after a day of classes in Port-au-Prince. Just before Christmas, I received a box from It’s Cactus containing a set of large sculptures I had bought while we were in Haiti in October. Usually when I receive an order, it is pulled from the warehouse shelves in Salinas, CA, packed, and sent on its way. 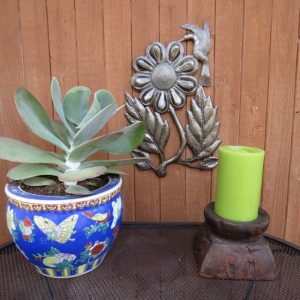 This time, however, I had made my order in Croix-des-Bouquets and it was boxed in Haiti separately from the rest of the It’s Cactus merchandise. When It’s Cactus received the shipment, my box was separated out and sent directly to me without any re-packing. I received it just as it had been packaged up in Haiti. I am telling you this because of the “surprise” I found inside: My sculptures had been wrapped very thoroughly and carefully in French lessons. Used up pages from French language workbooks; brought home, no doubt, by the artist’s school children who no longer had need of them. Waste not, want not. Wrap mine up in Kreyol! figures I read, (and you can too) about 1 Haitian in 19 is fluent in French, yet all lessons, from reading to math to science were taught in the French language, oftentimes by teachers who were not among the fluent. Can you even imagine the obstacle this was to a child’s ability to learn? Can you imagine the enormity of the educational handicap when it was applied to an entire nation? Reading comprehension is based on three things: the representation of letters, the corresponding sounds the letters make, and the meaning of the the collected letters that form words. A child who is unskilled in his own language and taught exclusively in another one may parrot the words that he hears correctly with no real understanding of what he has said. This is compounded in the case of a Haitian child due to the relative closeness of the sound of Kreyol words to French and the large disparity in their meaning. The upshot of all of this is that Haitian Kreyol-speaking children who have been taught only in French have had an incredibly hard time with reading comprehension and corresponding difficulty in reading to learn. Happily, change is in the air. The new government mandate seeks to promote Haitian Kreyol throughout all levels of education, from kindergarten to university. It entails the standardization of Kreyòl writing, and the training of teachers for instruction of, and in, Kreyòl. Studies clearly demonstrate that children who receive a solid foundation in their native tongue are “set free” to learn not only reading, math and sciences, but second and even third languages as well. Of course, the larger goal is to elevate the level of education of the population as a whole. Though it will take time, the reward should be greatly worth the government’s investment. With higher levels of skill in reading, math, sciences, and foreign languages, new generations of Haitian students will be able to realize their full potential as productive citizens of an emerging country. As for myself, I hope that maybe my next box from Croix-des-Bouquets will be packed in Kreyol lessons. I would take that as not only a sign of progress but also a sign of the Haitian government’s commitment to the success of the program. 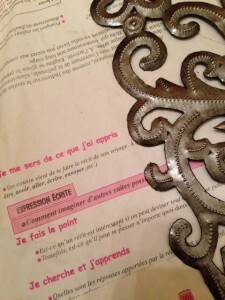 Used up Kreyol workbook packing paper – bring it on! 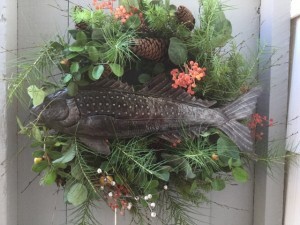 Merry Christmas is Jwaye Nwel in Haitian Creole. Children look forward to a visit from Santa Claus, known in Haitian Creole as Papa Nwel. In preparation, they clean up their shoes, fill them with straw, and place them under the tree or on the porch. Of course, they are hopeful that he will replace the straw with a wonderful toy or present, and that Papa Fwedad, the dreaded dispenser of lumps of coal (and worse!) does not show up instead! Claudy Soulouque with his sculptural wish for peace on earth. gather in parties collectively called Reveyon. Children are often allowed to stay up very late, playing games such as wosle (similar to jacks) and lighting sparklers and homemade fireworks. A creamy spiced coconut drink, known as Kremas flows freely (Recipes abound, but this one is a good representative, should you care to try.) while music, dancing and shouts of good will fill the night air until the wee hours. Jwaye Nwel. No matter how you say it, the traditions are dear and the feeling is warm and heartfelt at home, in Haiti, and around the world. Merry Christmas. And above all, Viv ak ke poze sou Late. Peace on Earth. It is the Season of Giving. What an opportunity to do good! Truly, it is a wonderful opportunity – one that anyone is loathe to squander. But how does one give effectively? Ah, that is the harder question. There are many ways in which to give, but I am going to boil them down to two and use the time-honored fishing analogy as my vehicle of explanation: If you give a man a fish, he eats for a day. Tomorrow, he might get a call that the new job is his and he will never have to learn to fish. You cannot foresee what brightness tomorrow will bring and in the meantime, you help a needy man over a rough spot. He might never know hunger again, yet he will always be grateful for the kindly hand that offered up the fish when the time was tough. Sometimes it works out that way, and when it does, it is wonderful. By giving opportunity, we give a gift that can last a lifetime. partners about the business of production and marketing, giving them the skills they need to feel success and see it grow. This is not an easy path, and achieving positive results takes a great deal of time and patience. 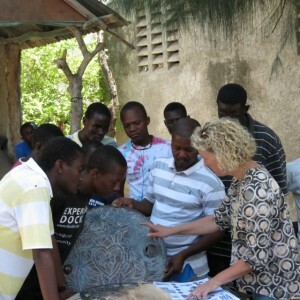 Yet we have seen terrific results in our 17 years of working with our Haitian artists and practicing Fair Trade. The best part of it is that we have seen success sustained. Once the opportunity is seized upon, once the lessons are learned, they sitck. They stay. They LAST. Here’s how: When a new artist approaches us with an innovative design to sell, he gets an order worth $100 USD to make samples. This enables us to evaluate his style and consistency as well as assess his ability to follow through on our agreement. 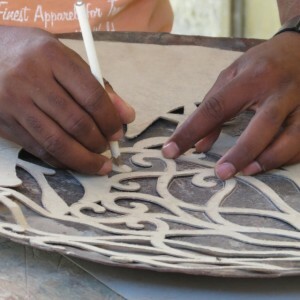 When those hurdles are cleared, we work with the artist to establish a selling price that is both fair and marketable. We discuss all aspects of pricing; teaching and learning in both directions along the way. When the price is settled, a new order is written, again with 100 percent paid in full up front. If you teach a man to fish, he eats for a lifetime. businessman. With lessons well-learned and well applied, the rise in his prosperity – though not meteoric – is substantial and sustainable. In this way, the gift of opportunity becomes a gift that can last a lifetime. Multiply that gift by the 30 artists we work with on a regular basis, and the impact on their families and their community becomes enormous. That success reinforces our continuing efforts to keep opportunity growing and expanding. Giving is a very personal thing. Bringing happiness in any form to anyone at any time is a worthy gift whether it is meant for a moment, a day, or a lifetime. Giving opportunity is simply how we at It’s Cactus choose to give. When you buy from us, you support our artists, and that is a very great gift, indeed.